The Hitech – Lowlife tour is promoting the first release from Kaosis on the European label, Atypeek Music. The single, also entitled Hitech – Lowlife was co-written by heavy metal archetype, Dino Cazares of Fear Factory, Brujera and Divine Heresy. 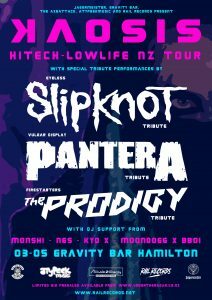 The Hitech – Lowlife Tour features the very best Metal & Metal fusion tribute acts the country has to offer with each show featuring 3 very special tribute guests. Kaosis are also taking some of Rail Record’s finest DJ’s out on the Road including Monshi, N6S, Moondogg x BBoi, Paul T Gheist, Melicious and rising trap artist KYD X.